It appears the revolutionaries were purposely bad shots. Well, that is at least what Yuri, the apparent leader of the coup, tells the Carringtons as they are assembled outside the palace. Not all the Carringtons - Alexis is no where to be found. Where could Alexis be? 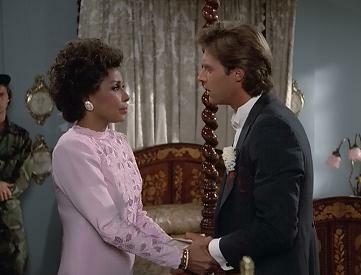 Since Joan Collins was negotiating her salary she actually sat out this episode which is obvious especially since Linda Evans/Krystle is given the scenes that seemed appropriate for Alexis. A couple of characters did die, though. Lady Ashley is gone. Jeff cannot believe it because he was going to marry her. Dominique informs Jeff that Lady Ashley was going to leave Jeff after the wedding and left a note explaining everything. Funny, the massacre must have wiped Jeff's memory of Ashley telling him that she was not going to marry him and that she was going to return to Paris following the wedding. At the least, it wiped the memory of the writers. The bandage on Luke's head is kind of cartoonish. Fortunately, we did not have to see Lady Ashley anymore. Luke Fuller, on the other hand, actually got to appear in this episode before he died. Luke spends his final moments with Steven as the two express their fondness for one another. It is not until Luke is dead that Steven tells him that he loves him. Blake is so touched by this scene that he is now ready to accept Steven's values as the equal of his own. I guess it only takes two dead gay lovers to finally get Blake to see the light. At least Blake did not kill this one. 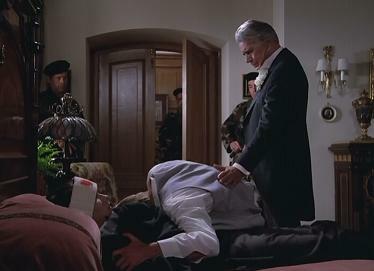 Note to the men of Denver, do not get involved with Steven Carrington unless you have a death wish. It's a shame, I really liked Luke! Prince Michael is having a hard time understanding the concept of a coup d'etat. He keeps ordering the revolutionaries around as if he is still in power or something. Michael also believes that he is sovereign when it is announced that King Galen has died. It is tough to be sovereign when you have been deposed. Oh, and Galen is not dead, Krystle sees him alive which does not make Yuri a happy person. Ultimately Yuri just wants all of these people out of his country and has a plane chartered for them to leave in four hours. Oh, but everyone will not be on the plane. Prince Michael, a coup means you are no longer in power. The Interior Minister has decided that he wants Moldavia to end its deal with Colby Co and wants one with Denver Carrington. Instead of dealing with Alexis (we know why) or Blake, the Minister deals with Krystle. The negotiations do not go well and Krystle is detained. 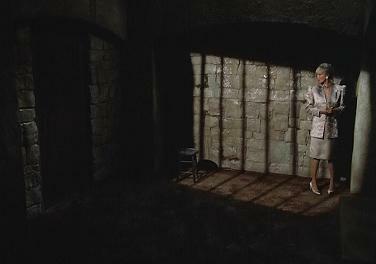 By detained, Krystle is being held in a dungeon. Seriously? You would think Moldavia would have more modern accommodations. Heck, why not put the rack or the iron maiden down there. It is obvious that these scenes were meant for Alexis. Dominique explains to Jeff what Ashley already told him. The Interior Minister also thinks he can keep Dominique in Moldavia as some sort of kept woman. The Minister offers Dominique the right to live in one of the King's palaces with the Minister visiting from time to time. Dominique has no time for that and she is shipped off to the airport with the rest of the clan. Well, the entire clan is not there - Alexis and Krystle are still missing. Blake is going to rescue Krystle. Blake better hurry because Krystle does not seem like the type who will do well in the dungeon even if she is still able to do so in heels (I am impressed by how all the woman have continued to wear heels throughout this episode). There were some plot development outside of Moldavia. Apparently, word of the coup did not make it to American news outlets. Sammy Jo finally fills in the clueless Rita into her plan of having Rita impersonate Krystle so that Sammy Jo can get revenge on all the Carringtons, but especially Aunty Krystle. Even though she suspects it to be illegal, Rita is game. It is just another acting gig. Well, not just another gig because Rita may actually get paid this time. Who keeps an opened chocolate bar in his pocket? Finally, we have Fallon a/k/a Randall Adams buying a bus ticket to somewhere in the Rockies. Where is Fallon getting this money? Moreover, why is Fallon pulling up the sports section of the newspaper while waiting for her bus ticket? Even more interesting, why is there a picture of Miles Colby attending a polo tournament making the front page? I can go on. Anyway, the name Colby sparks something in Fallon that possesses her to stalk Miles at the polo tournament. How did she afford to get there? Anyway, Miles is smitten by Randall/Fallon and offers to take her to dinner. Seriously, what else does Randall/Fallon have to do? Yuri: We might have killed all of you, but we are compassionate. Claudia: Oh Adam. how can you talk about marriage at a time like this. Blake [to Steven]: I was wrong. I thought you'd be happier living by my values. That was wrong of me. I can see now your own values work as well for you as mine do for me. Miles: You are marvelously secretive. Fallon: I just wish I knew what that secret was. Dominique: I don't drink with assassins.